For a third consecutive game, Liberal and Garden City played to overtime. Garden City led most of the game and beat LHS 57-52 in front of a shocked Big House crowd. It’s the Buffaloes fifth straight win in the Big House. It brings back memories of last season when Garden won in Liberal and finished 1-7 in the WAC while LHS was 6-2. The Redskins led 11-7 and 14-11 in the first quarter. The Buffs took control in the second leading 23-18 and 25-20 before Deladris Green jumper at the buzzer made it 25-22 GCHS at the break. The Buffs led by as man as nine (42-33) with 6:28 to play. The Buffaloes led 47-42 with 2:30 to play. 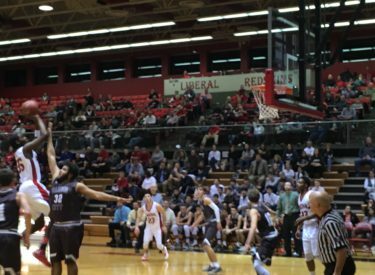 Cade Hinkle made a guarded three with 4.6 seconds left from what has become Liberal’s amen corner in the right corner to the west basket. The shot tied the game and helped send it to overtime. A Kylan Thomas bank shot and free throw gave the Redskins a 52-49 lead in overtime. But LHS did not handle the lead well with untimely shots and turnovers and did not score again. Liberal is 7-1 and 1-1 in the WAC as Garden City has won three straight and is 3-6 and 2-0 in the WAC. Liberal plays at Dodge City Friday night at about 7:45 on 1270 and kscbnews.net.